It's not unusual for 17-year-old to find themselves in hot water with the fashion police. But on a flight from Virginia to Florida, Vanessa Gibbs found herself detained by the Transportation Security Administration (TSA) over the appearance of her purse. 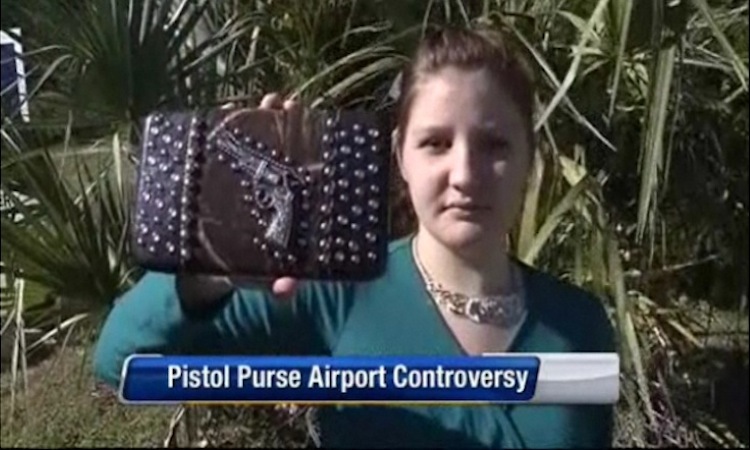 "It's my style, it's camouflage, it has an old western gun on it," Gibbs told News4Jax.com. Gibbs didn't run into any trouble while traveling north from Jacksonville International Airport. But on her way back home, TSA officials at Norfolk International Airport pulled her aside. "She was like, 'This is a federal offense because it's in the shape of a gun,'" Gibbs said. "I'm like, 'But it's a design on a purse. How is it a federal offense?'" After TSA agents figured out the gun was a fake, Gibbs said, they told her to check the bag or turn it over. By the time security wrapped up the inspection, the pregnant teen missed her flight, and Southwest Airlines sent her to Orlando instead. The changed itinerary created no small amount of anxiety for Gibbs' mother, who was already waiting for her to arrive at the Jacksonville airport. "Oh, it's terrifying. I was so upset," said Tami Gibbs, the teen's mom. "I was on the phone all the way to Orlando trying to figure out what was going on with her. It was terrifying." Less terrifying is the actual design on the purse, which is only a few inches in size and hollow. "I carried this from Jacksonville to Norfolk, and I've carried it from Norfolk to Jacksonville," Vanessa said. "Never once has anyone said anything about it until now." Nonetheless, the TSA says the design could be considered a "replica weapon," something that the agency has banned since 2002. Just imagine what would have happened if Gibbs had also been wearing stiletto heels. • Black college student hangs Confederate flag in dorm room, admits it's "kind of weird"